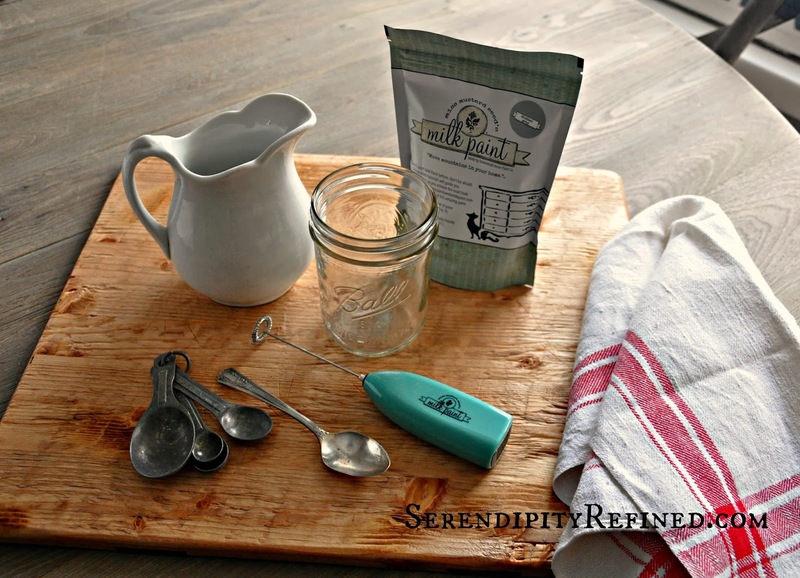 A couple of weeks ago, I finally started using the Miss Mustard Seed Milk paint products that I purchased last fall from Robyn Story designs (Link HERE). 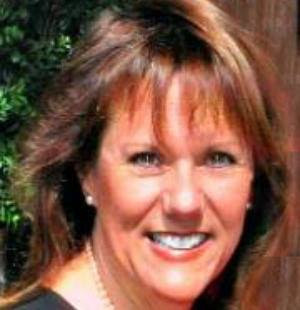 (I'd highly recommend Robyn for your MMS needs. She sometimes offers free shipping and her staff is incredibly helpful). Two weeks ago, I used MMS hemp oil to restore and preserve vintage, unpainted, wood pieces in my home. 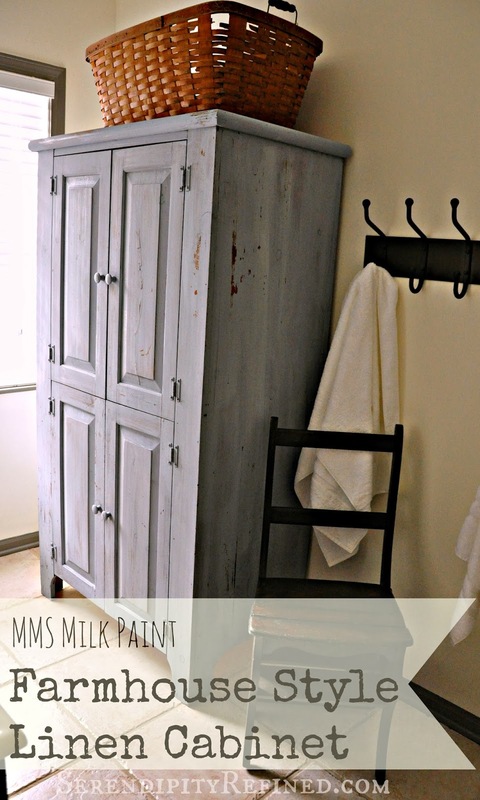 This week, I'm sharing a very basic paint job on a pine linen cabinet for the bathroom. Last week (when I made the canvas artwork with the poem about small houses) I told you that if you stopped by my French farmhouse on any given day, you might find me refinishing furniture in the bathroom? Well, I wasn't kidding. 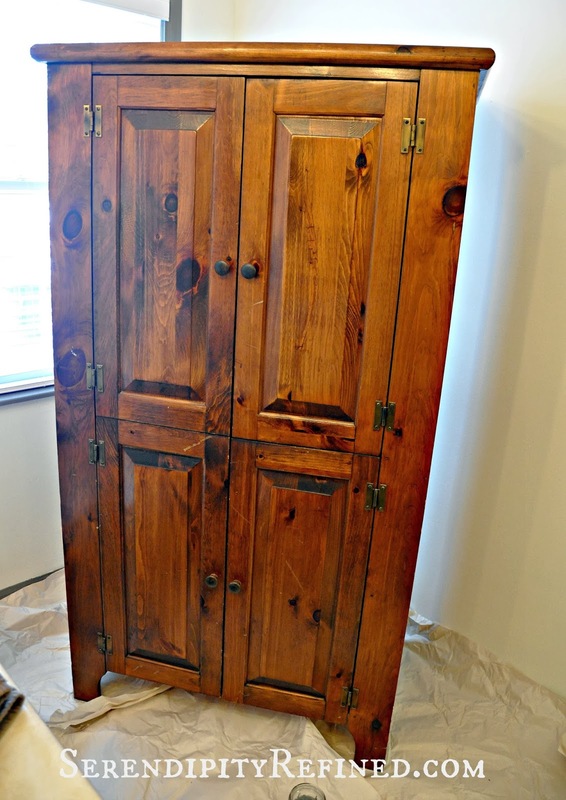 This is an old pine cupboard that my husband owned before we were married. 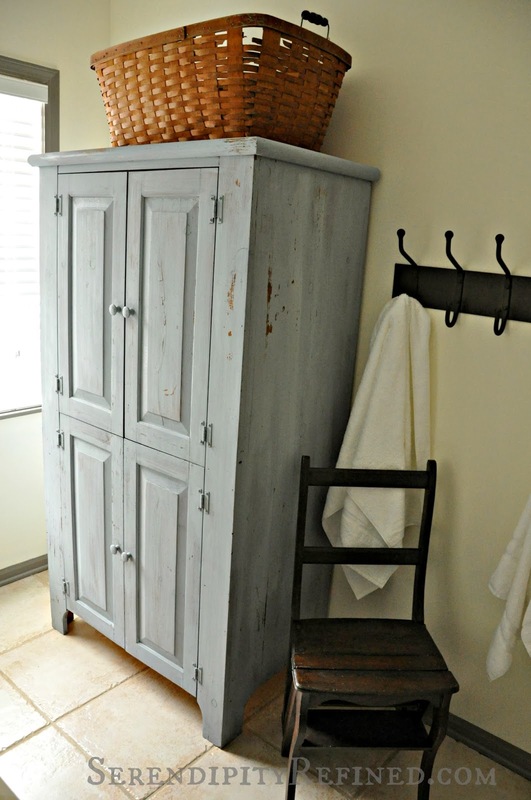 It's held everything from a television to board games and now, it has become the linen cabinet for the bathroom. Disclaimer: This is not a sponsored post. In fact, I'm certain that Miss Mustard doesn't even know that I exist. I ordered and paid for these products just like you would. I am not loyal to any particular brand of paint and use whatever products will provide the look and finish that I'm seeking for the piece that I'm creating. My opinions are 100% a result of my own experience with the product. Whenever I'm painting inside, I use either an extremely low or no-VOC paint. Fortunately, these days, almost every good paint line, including Benjamin Moore (Natura), Sherwin Williams (ProMar 200), Annie Sloan, La Craie Maison Blanche (Zero VOC Primers and Extremely Low VOC paints), Homestead House, and Miss Mustard Seed offers a "no VOC" paint product line. This means that the paint is basically odorless, isn't harmful to the environment and is safe to use indoors. 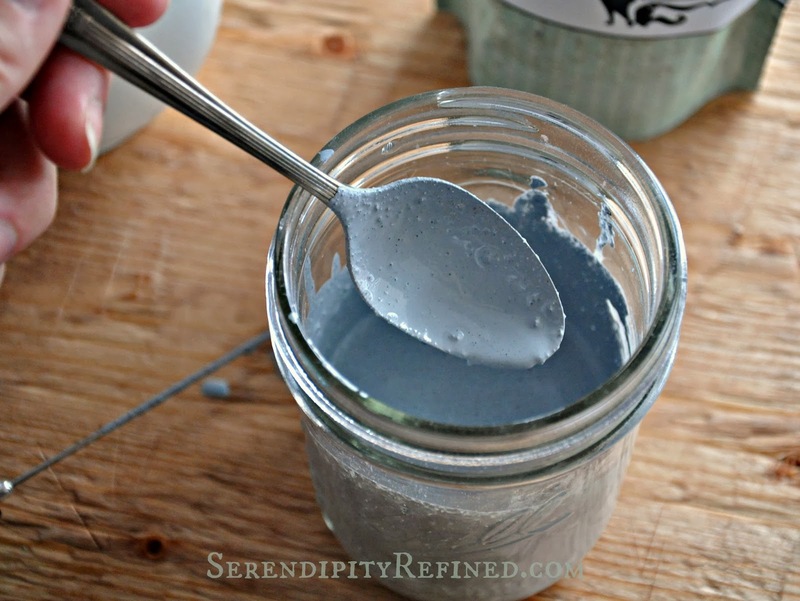 The thing that's different about MMS and Homestead House (who makes MMS) is that the paint comes in a powdered form and is mixed with water when you're ready to use it. This is great because you only make what you need and the powder is less bulky to store and has a long shelf life. 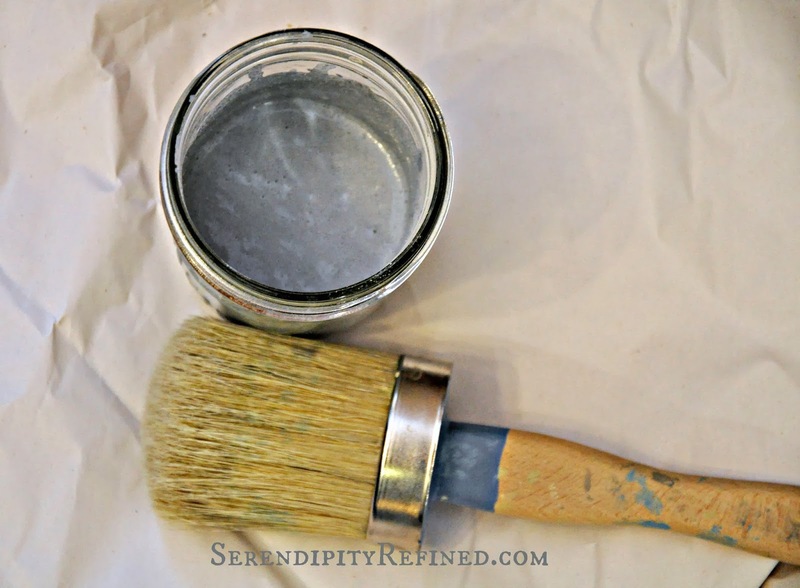 The other thing that I really like about the decorative paint products that I've used (Annie Sloan, Homestead House, La Craie and MMS) is that none of them requires any prep work beyond dusting the surface. 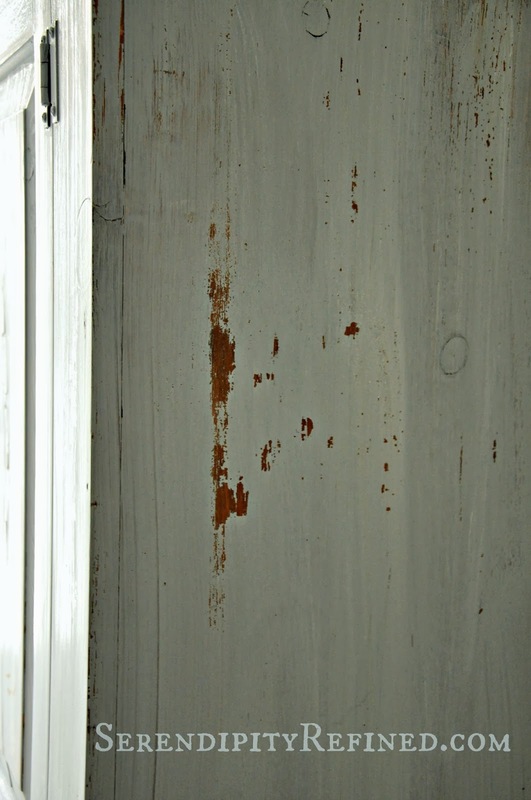 This means that there's no sanding and no priming involved when painting over existing finishes. The other thing that I like about MMS paint is that, as I'll be showing you in the coming weeks, you can mix the paint to a thicker consistency to use for raised designs or thinner to use as a color wash. On this piece, I mixed the paint to a consistency that was just slightly thinner than normal paint. I used 1 part water to1 part paint powder. 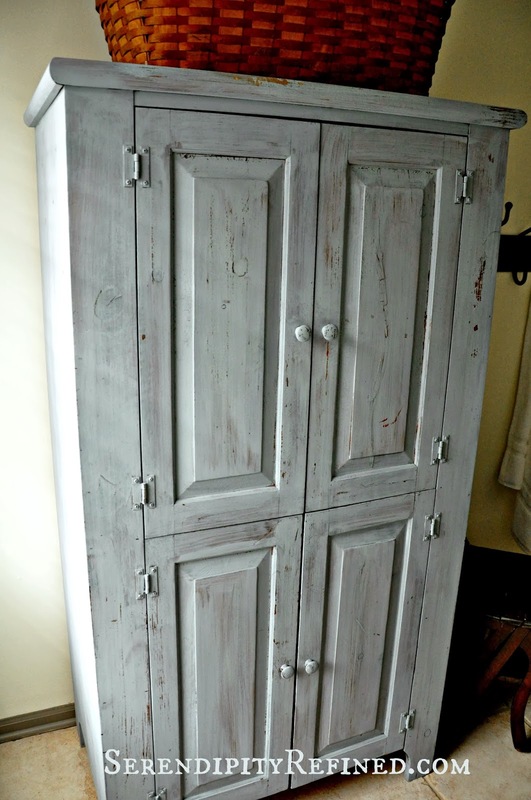 I used a total of 1 cup of paint powder and 1 cup of water for this cabinet. 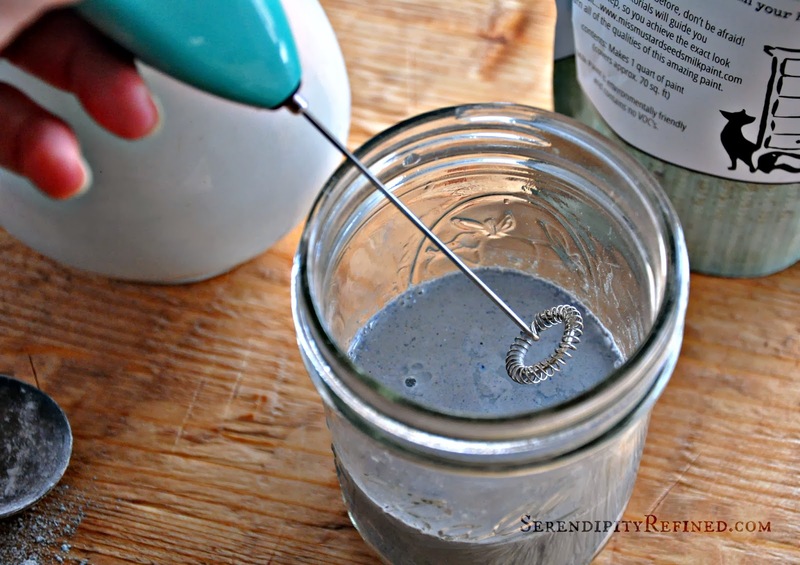 First, I measured the paint powder and water into a mason jar. Then, I got out my cool little battery operated blender to mix up the paint. Unfortunately, it didn't work. I checked the batteries (brand new), the switch (on) and jiggled it a little bit. I was able to get it to vibrate briefly but it didn't stay on so I actually ended up mixing my paint with a spoon and it worked just fine. The paint does have a few small lumps and a slightly gritty texture but it didn't affect the overall look of the cabinet as I painted it. MMS also sells a line of brushes but I had my trusty ASCP brush on hand and, since they appear to be similar in design, I just used the one that I had. After having painted with the paint, I believe that any good brush natural bristle brush will work well with this paint but it is, of course, a matter of personal preference. The paint went on quickly and beautifully. If it was too thick, I would have added 1/2 teaspoon more water, if it was too thin, 1/2 teaspoon more paint to get it to the consistency that I like to work with. If I had wanted a more solid and uniform finish, I would have used MMS bonding agent first. The bonding agent is also recommended when more uniform coverage is desired or when layering multiple colors. It is not necessary when painting over raw wood but this piece was previously finished. I'll be showing you other processes and how they're accomplished in coming weeks. Let me start by telling you that there's really no magic to painting furniture other than a few tips and tricks that I've picked up through my years of being an art student, a decorative painter, (and by watching the YouTube videos which are now readily available for all of the products that I've used). If you ever have questions, please feel free to contact me! I'm happy to email or jump on a quick phone call to talk about your project. If you're in the Chicago area, I may even be able to make a house call, if needed. I wanted the finish on this cabinet to be rustic but not too chippy and fortunately, that's the way that it turned out. I say fortunately because, when using Milk Paint, there's really no way to know whether the piece will chip a lot, a little, or not at all, until you paint it. There are ways to "encourage" chipping (by treating the surface with wax or with hemp oil which I'll be covering in a future post) but since this was my first experience with milk paint, I wanted to keep the process simple and the results as uncomplicated as possible so that I could share them with you and we'd have a "starting point" for future posts that I'll be doing on this paint. I also could have given this piece a second coat of paint to make the color more uniform but I wanted an aged appearance so, after a single coat of paint, I simply allowed the cabinet to dry for 24 hours and then sanded it and gave it a coat of clear wax (I used Annie Sloan but any soft, clear, furniture wax will work). 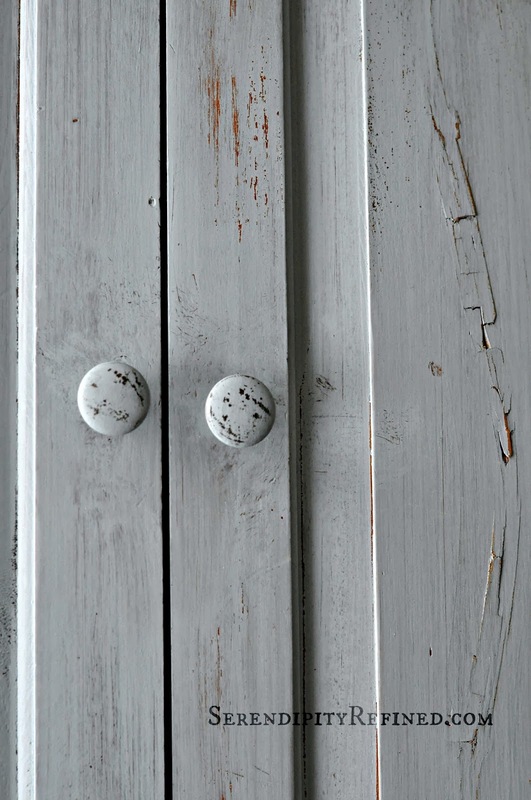 Originally, I was going to apply a coat of MMS Ironstone over the Shutter Gray and use antiquing wax...or white wax but I fell in love with the simple., pale blue-gray color of the paint and decided to leave it as it is...for now. 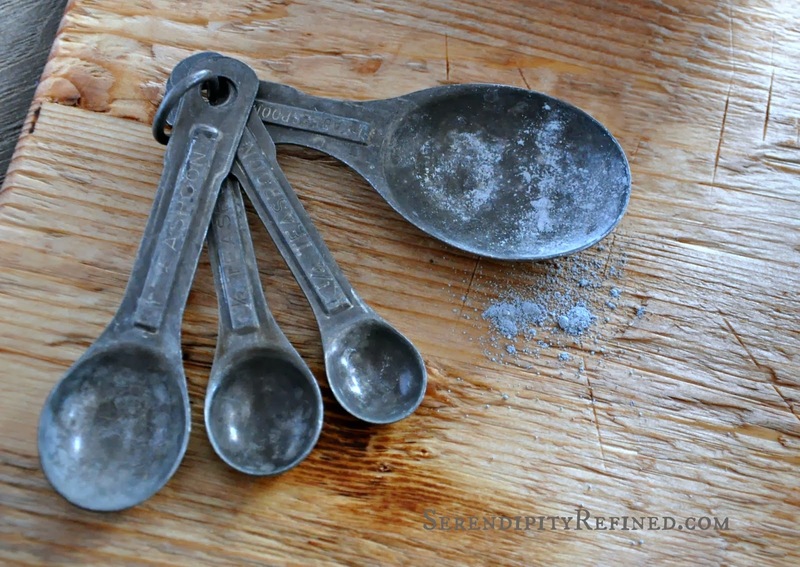 Besides, now that my storage locker is empty, I've got lots of pieces to paint for the farmhouse which means lots of pieces to practice the various techniques that I've mentioned and to share them with you! If you'd rather not paint your own piece(s) and you live in the Chicago area, I'm available to paint your pieces for you (in my studio or your home, where necessary) using a wide variety of product lines, finishes and applications. I'm happy to discuss rates based upon your specific project. Email me for more information. 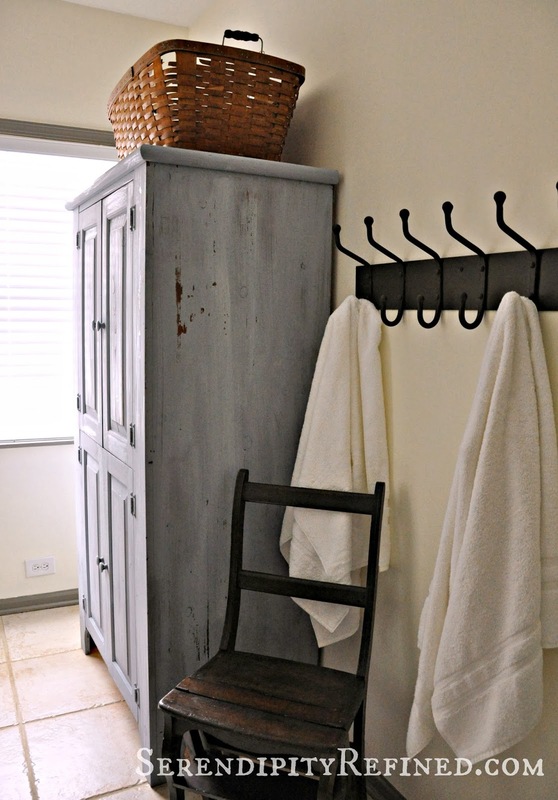 I loved transforming my humble pine cupboard into our new bathroom linen cabinet using Miss Mustard Seed Shutter Gray Milk Paint. I love MMS paint and you'll be seeing it on my page again very soon. It's versatile, easy to mix, and easy to work with. It has no VOC's and is comprised of all natural ingredients. I chose not to use the bonding agent on this piece and the fact that I couldn't predict or control the chipping was not an issue for me. The mixer didn't work at all so I can't recommend it. I used my own brushes and wax that I had on hand.